Vision treadmills are sold by Johnson Health and Fitness, one of the largest exercise equipment manufacturers in the world. The company is based in Wisconsin. If you or one of your kids ever owned a Trek® bike, then you’re familiar with at least one excellent Vision Fitness product. They also make ellipticals, stationary bikes, and strength training equipment. Vision Fitness is an innovative treadmill maker in many ways and they have received many accolades over the years. They consistently rank at the top in terms of product design and customer service. The company has also received numerous Best Buy awards for several of their treadmills over the years, so you know that their machines are top-notch. One of the unique features, also found on the company's upper end Matrix line, is the ability to choose your own console. There are three choices, including the base Classic, the mid-level Elegant and the top of the line Touch +. The current lineup includes four models: TF20, TF40, T40, T80. The folding series consists of the entry level TF20 and up-level TF40. The entry level TF20 features a 2.75 CHP motor, 15% incline, a 20" x 57" running area, up to 16 workouts depending on console choice, wireless heart rate monitoring with strap included and a 375 lb. max weight capacity. Stepping up you have the TF40, with a stronger 3.0 CHP motor, a larger running surface (20" x 60") and a better warranty overall. Otherwise, it is nearly identical to the base TF20 treadmill. The non-folding series consists of the entry level T40 and up-level T80. The entry level T40 features a 3.0 CHP motor, 15% incline, a 20" x 60" running area, up to 16 workouts depending on console choice and a 400 lb. max weight capacity. Stepping up you have the T80, with a larger running surface (22" x 60"), Ultra Zone cushioning and a commercial-grade, reversible belt. 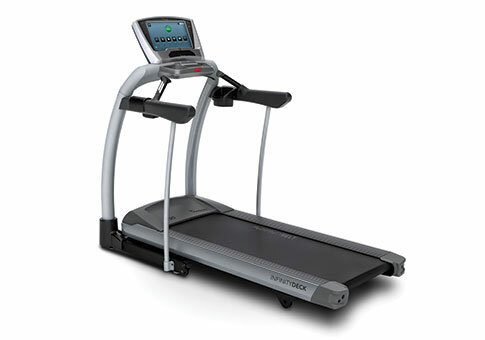 The T40 is very similar to the TF40, so the non folding series really doesn't have an entry level treadmill like the TF20. And the T80 is much more commercial-grade than any of the other models. Which Vision Treadmill Should You Choose? Making a decision is pretty easy with Vision treadmills as there are only 4 models to choose from, and only 2 within a series. For most people, it comes down to budget, as there is a considerable difference in price. The base Vision Fitness TF20 costs just around $2000 with the basic Classic console, while the top of the line T80 starts at around $3800. So there's quite a disparity in price. If you are interested in a folding treadmill, we would consider the TF40 over the base TF20 as it has a larger deck and a stronger motor, and is more durable overall. It's only around $400 more expensive, and in our opinion worth the additional expenditure. If you don't need a folding machine, look at the T40 as it is the same as the folding TF40, just a little shorter. The T80 is fantastic, but you don't necessarily need such a high-grade machine unless the treadmill will see some very heavy usage by multiple individuals. Otherwise, you'll be just fine with the T40. So our picks are the TF40 or T40, and if you just want the top of the line model and have the budget for it, the T80 is beast. What about the console choices? As far as the consoles, the company let's you pick which one appeals to you, which is always a nice touch. As we mentioned, there are three consoles to choose from. The base console is the Classic, an extra large LCD display with a USB port, Passport HD video connection (for viewing on your TV) and 5 workout programs. The Elegant console is a step up from the base Classic, a 10" HD touch screen with ViaFit workout tracking, Virtual Active (for viewing HD videos on the machine itself), W-Fi and 12 built in workout programs. 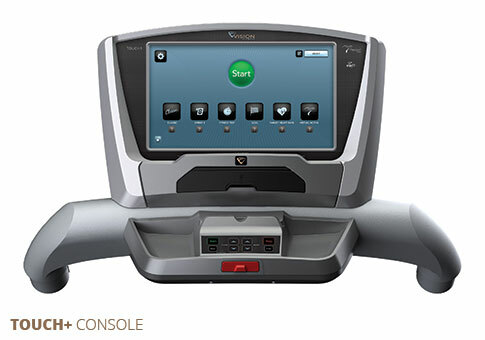 The Touch + Console is an even larger 15.6" HD touch screen with smart phone compatibility and 16 built in workouts. Which one should you choose? The Classic is just fine and will save you the most money. It has an ample amount of workout programs, feedback and the ability to hook up HD destination videos on your TV. However the Elegant and Touch + give you many more workouts, including the company's patented Sprint 8 workout, plus touch screens and workout tracking, which more and more people are interested in these days. Our pick would be at least the Elegant, for about $500 more than the Classic, or the Touch + if your budget is more open, which is about $1000 more. But again, the Classic will serve you just fine if budget is an issue at all. One difference you’ll find on Vision Fitness treadmills from some other brands is that they use low-maintenance, 1-inch, pre-waxed, Phenolic decks. The wax is absorbed into the belt and acts as a lubricant between it and the deck over hundreds of hours of use so there is no need to add silicone. (The deck can easily be re-waxed if needed.) Vision’s upper-end treadmill models come with reversible decks for even longer life. Users will also enjoy the thick 4.4 mm orthopedic treadmill belt that comes standard on all Vision Fitness models, as well as the 8 variable-durometer elastomer cushions which act as extra cushioning on the deck for the foot strikes and push offs. Vision also offers exclusive technologies such as Sprint 8, a science based 20 minute workout that delivers incredible results; ViaFit workout tracking (also available on some Horizon models); and Virtual Active, which offers high definition videos that make you feel like you are actually running in those locations. We like the Vision treadmills in terms of reliability and overall quality, especially with the new console choices. This is a fine line of machines that can be ordered online from Vision Fitness, and it will be delivered to your home and set up by their local licensed fitness retailer. You can read more in-depth Vision treadmill reviews below, with specs, prices, buying tips and more comprehensive info to help you make a more informed decision. Vision TF20 Folding - the entry level model ideal for walking and jogging with nice features such as Sprint 8 and Virtual Active. Vision T40 Non-Folding- packed with great features like ViaFit, Passport and Sprint 8, the T40 is a great choice in the $2000+ category. Vision TF40 Folding - everything you get in the T40 model, except with a foldable frame. A great choice with tons of great features and console options. Vision T80 Non-Folding - the top of the line commercial model is the gym-quality version if you're looking for a rock solid treadmill that will last through years of heavy usage.